ON TOP OF THE HILL and NEXT TO TRAILS! Nearly 3,000 s.f. 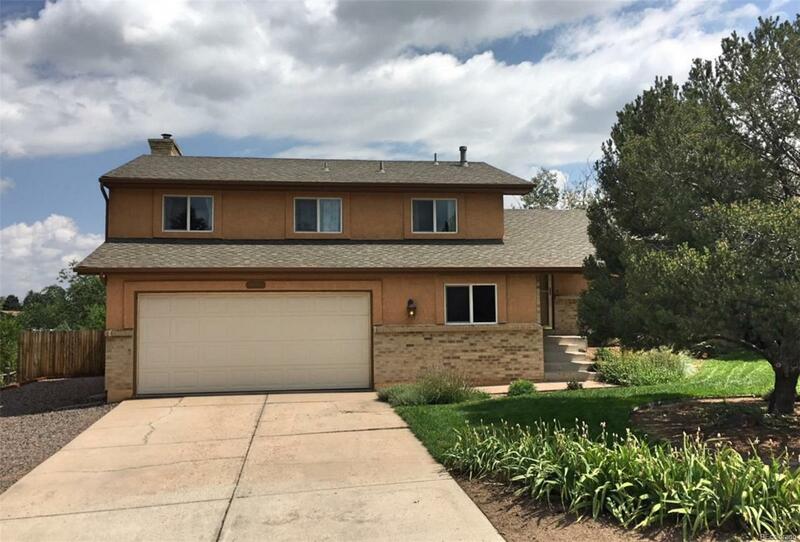 of lovingly cared for home on almost 1/4 Acre in N/E Colorado Springs. Great City and Mountain Views from the HUGE Trex Deck and near 10.6 miles of Premium Hiking on sidewalk trails in the city! Welcome home to the Homestead neighborhood with mature trees and quiet living. Step inside to large rooms and plenty of space for everyone to stretch out and claim their favorite spot. Beautifully updated kitchen featuring rich silestone quartz countertops, travertine backslashes, cherry cabinets with soft-close drawers and a large island. Newer stainless steel appliances as well. Enjoy the Spacious Living room and Family room with a Bonus Family Room in the basement! Four nice size bedrooms upstairs so everyone is on the same level, and a large bright and sunny laundry room. This home features newer, low maintenance stucco, vinyl windows, newer water heater and roof (2016).. and has been extremely well maintained.